Late day at work - so I decided to try PoseManiacs 90 second images for my daily sketch. Wow, the figures were in tortured positions and 90 minutes went by very fast. I did 3 of the images and then added my grand daughter's hands and feet to the page for more human figure practice. 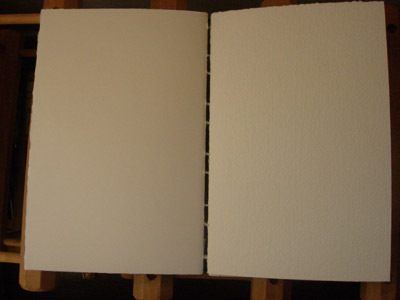 The is a recycled book in which I inserted signatures of 140 and 90 lb watercolor paper. I used a bone folder to press the paper and a coptic stitch, pulling the linen thread as much as I could. I didn't use tape or glue paper or cloth over the spine. I wanted to make sure that glue didn't get between pages - preventing each page from opening flat. 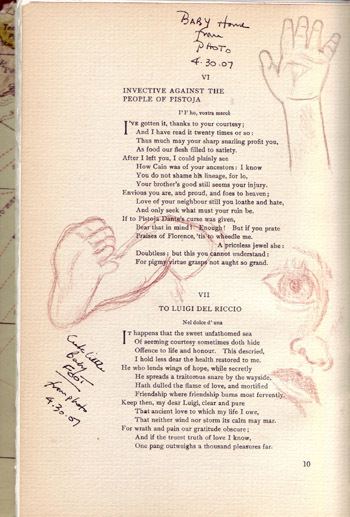 The book was made from a 50+ year old book of Micahelangelo Sonnets and his drawings were scattered throughout the book. I incorporated many of the original pages in my book which is intended for figure drawing practice. What better inspiration could I have? Here is the first mixed page layout. 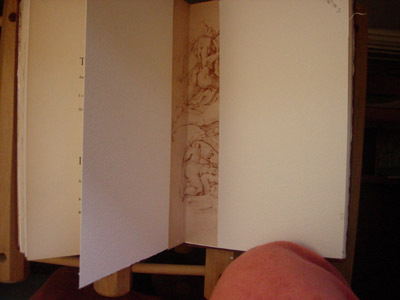 I decided to cover the two gaps between signatures with a piece of Michaelangelo's drawings - one page was divided in half and glued in place with PVA glue. 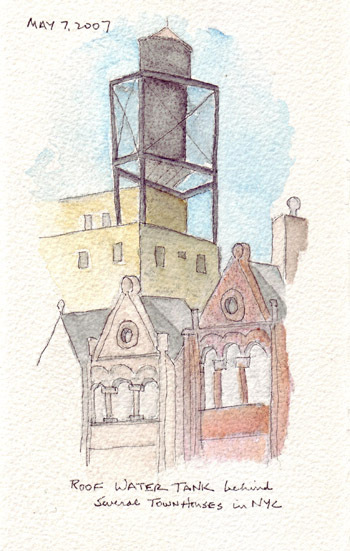 I am starting a series of New York City sketches - when the spirit moves me - probably in nice weather and when I have time to take a walk and sketch without needing to get somewhere. Since it is hard for me to decide what I want to sketch in this big city, I will walk 10 blocks (1/2 mile) and then select something from the 4 directions that I can see. Today was "10 block series #1" - and I stopped in a my neighborhood independent bookstore, sat on a bench, and read for awhile along the way. 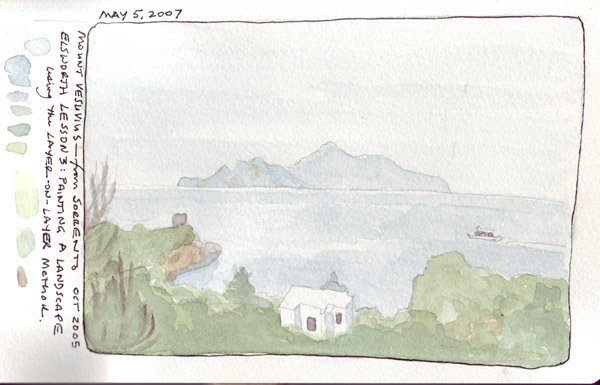 Only when I reached my destination did I realize that I only had 12 watercolor pencils with me. This was very liberating and I think the sketch is looser. I added ink and water when I came home. My only disappointment is the Arches 140lb rough paper. I bound many kinds of watercolor paper in my recycled books so I could experiment and I don't think I'll buy "rough" again anytime soon. Here are journal pages from May 3rd, 4th, and 5th. I think it might be easier if I at least scan them daily, because my evening hours are too short to do everything I want to do. I definitely won't take the time to also upload them to the Every Day in May Flik'r group. May 2nd: There was no sketching or photography allowed at the Met's exhibit "Barcelona and Modernity." 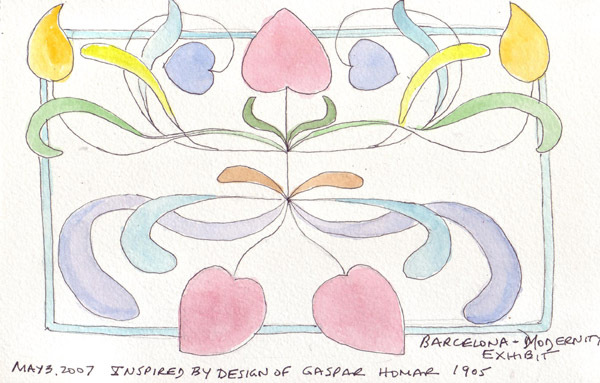 But I was taking a few notes in a really small notebook when I saw the Gaspar Homar's 1905 furniture design drawing. I still think like a quilter and I still collect images that I want to save for textile projects. The guards couldn't really see that I was sketching instead of writing. The top half of the image is Homar's and the bottom half is my addition. The colors are all mine. 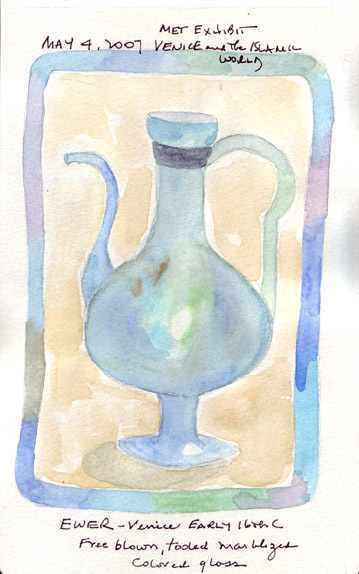 May 3rd: I was permitted to sketch in the "Venice and the Islamic World" exhibit and among the many pieces of Venetian art that were inspired by their Islamic trade, I found this "ewer." The surface was marbelized, something I couldn't do on this journal page. However, I tried to capture the shape and colors. May 5th: I was "stuck" on the last exercise in Lesson 3 of the Elsworth Watercolor Skills Workbook because I don't love landscapes. My city landscape has really tall buildings everywhere! I finally decided to work from one of my photos, taken during a wonderful trip to Sorrento and the Amalfi Coast in Oct 2005. The exercise was to paint a landscape using the layer-on-layer method - and here is Mount Vesuvius from Sorrento on a partially clear day. I am trying multiple methods to improve figure drawing and at this moment I'm still primarily doing outline drawings. During April I recycled a book of Michaelangelo's sonnets and I incorporated some of his drawings among the new pages for inspiration. The above sketch is based on a Posemaniacs.com figure of the day. I used pencil and some watercolor wash.
Several sketches from a photo of a baby - to try to capture their chubby hands, chubby feet, and big eyes. These sketches were done using colored pencil on one of the original sonnet pages that are on the back of the page with Michaelangelo's drawings. This is my journal page from May 1st - another daily pose from posemaniacs.com. Yesterday I posted this week's EDM Challenge which was done on May 2nd. Tomorrow I'll post museum-inspired journals pages from May 3rd and 4th. I'll then continue to post journal pages sequentially and I'm just hoping that I have time to post everyday in MAY.